I found a Dug North pattern for this model on the internet and built it in early 2009. 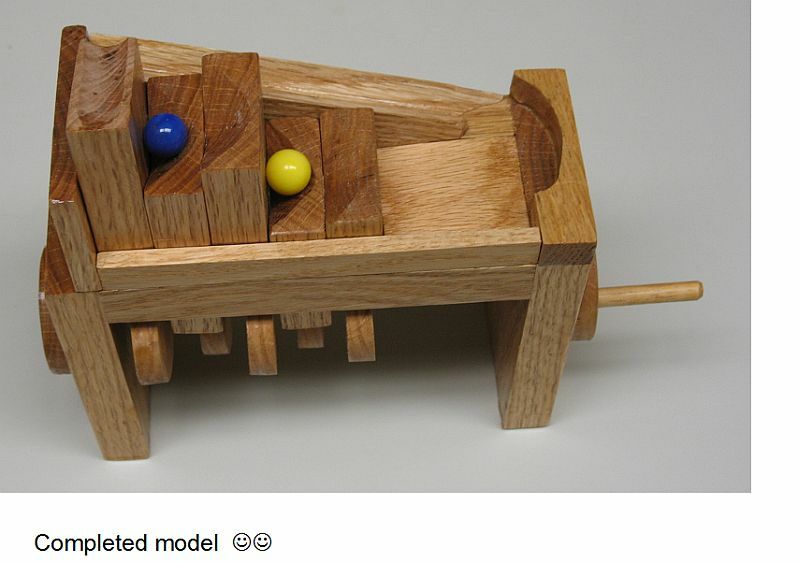 Here is a link to this model in action. 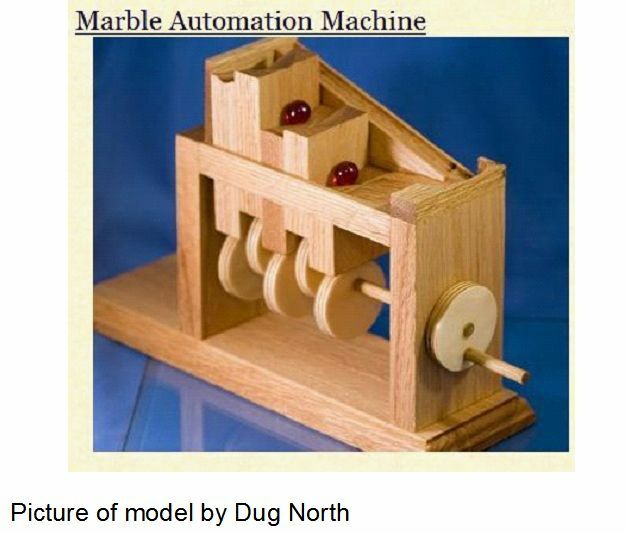 Around April 2009, I built a marble automaton designed by Dug North. See above for a picture of the finished automaton and a video of it working. This design has some imperfections. I decided to make a 2nd automaton, but improve upon the design weaknesses of Dug North's design. Let's revisit how we made the 1st model, show my design improvements, and then show my finished automaton of the improved design. marked centerline of cam on ¼” thick side piece with pencil and wood cams in place. put spot of glue on with toothpick on cam 5/16” shaft, then finished rotating the cam into place. if you use paper pattern with multiple cut-outs……then you can make sure grain direction is same orientation on adjacent cams when you are rotating them into final angle at glueing. 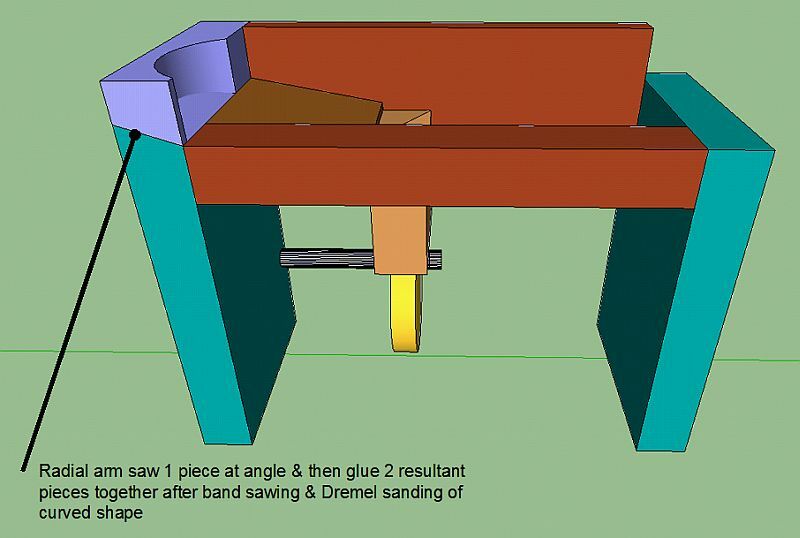 Did not attach 2 end pieces on camshaft until very end, this lets you slide cams and camshaft out after glueing to access for polyurethane…….otherwise not enough clearance on end cam to varnish. thick on top of ¼” inch thick piece for a stop. This fixed this. Had trouble when I clamped it up while glueing early on, bottom of 2 main ends not flat on table. Sanded a little trying to level up. 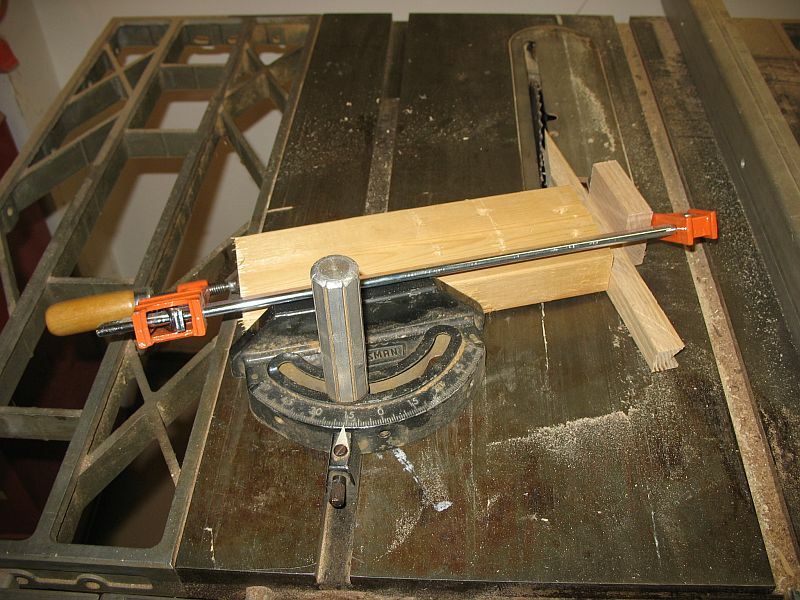 Make sure 2 bottoms remain flat on table during glueing operations. I cut the 45 degree groove in the track on the table saw by making 1 pass, then turning track around and making 2nd pass. It took me 4 scraps of 3/4 x 3/4" pine to get the saw blade depth set correctly....before I cut the real oak track. 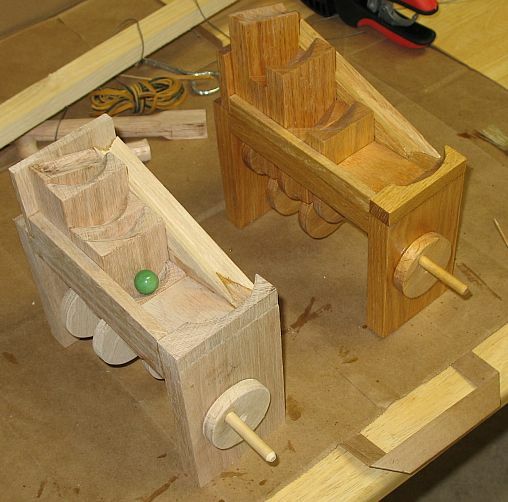 I may build another one of these, using colorful woods for the pistons like padauk, purple heart, and yellow heart. 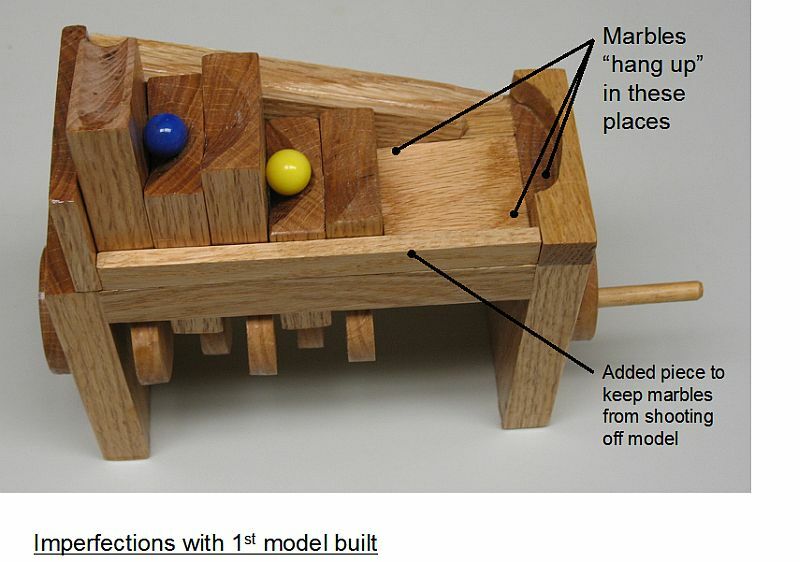 A woman requested I build another marble game. She works with Special Needs children age 3 to 10, and thought they would like the crank game. I reviewed the latest design I had, and decided to beef up the design to handle constant usage by children. I added (5) quarter-inch diameter dowels to beef up the design. This should keep it from breaking if it experiences rough usage. 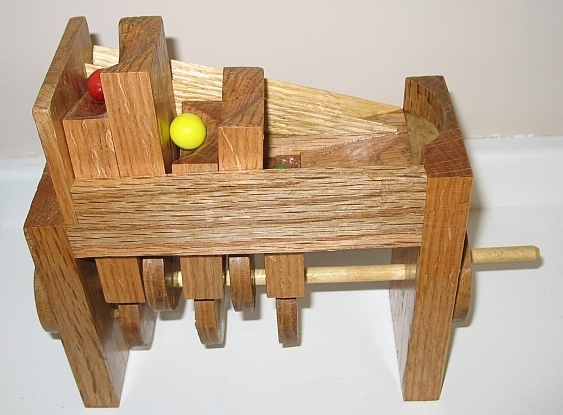 I used Golden Oak stain on the previous marble games. 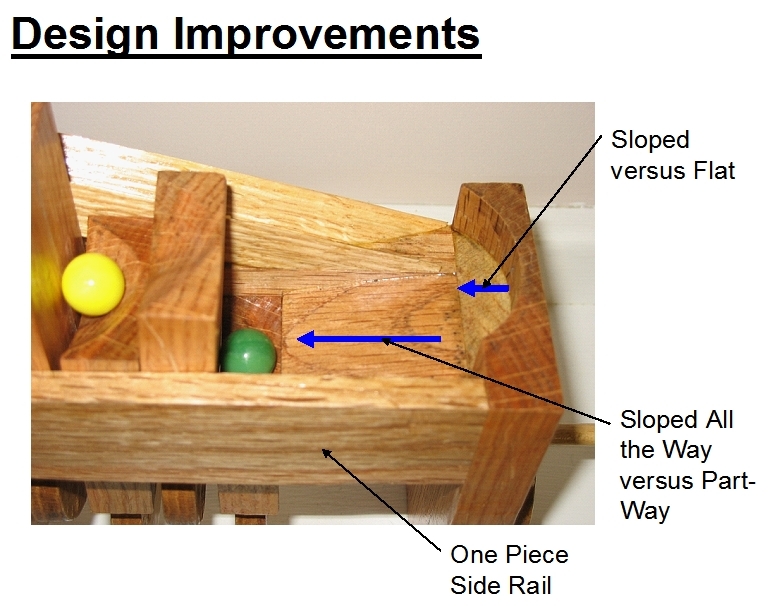 It looks nice so I'm using it on the 2 new marble games being built in November of 2015. On previous models, I used the table saw to make the V-notch. This took a lot of time to set up the saw to get the 2 cuts just right for the notch. My improvement is to just us a 3/4" diameter round nose router bit. I split it up into 3 passes, but it doesn't take very long to change my router table depth setting. Much easier and less time than the table saw! I laid out the angled cut-out needed on top of each piece. I then used a 3/4" inch diameter drum sander with 60 grit to quickly shape the marble cavity. This method worked very well. Here are all the pieces for the 1st new game all stained with Golden Oak. I stained both new marble games, and wanted the stain to dry a little quicker, so I could put on the 1st coat of polyurethane. I put the pieces in the oven between 100 and 200F for about 15 minutes to dry the stain. I have used this before and it works well. 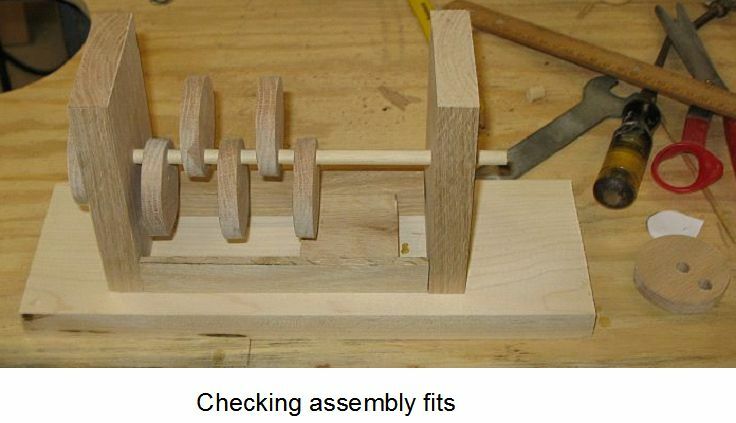 The parts for Elegant Basket #17 are also in this picture. On the first of two units I built. I used the ~2 hole saw to make all 7 round discs required for one unit. Then I remembered there aren't supposed to be any center holes in the 5 cams. I glued in short pieces of 5/16" diameter dowels, then took them to the belt sander and sanded them flush. On the 2nd unit, I cut out 5 rough discs on the band-saw, then drum sanded then to final diameter. Then I drilled the off-center 5/16" shaft holes. 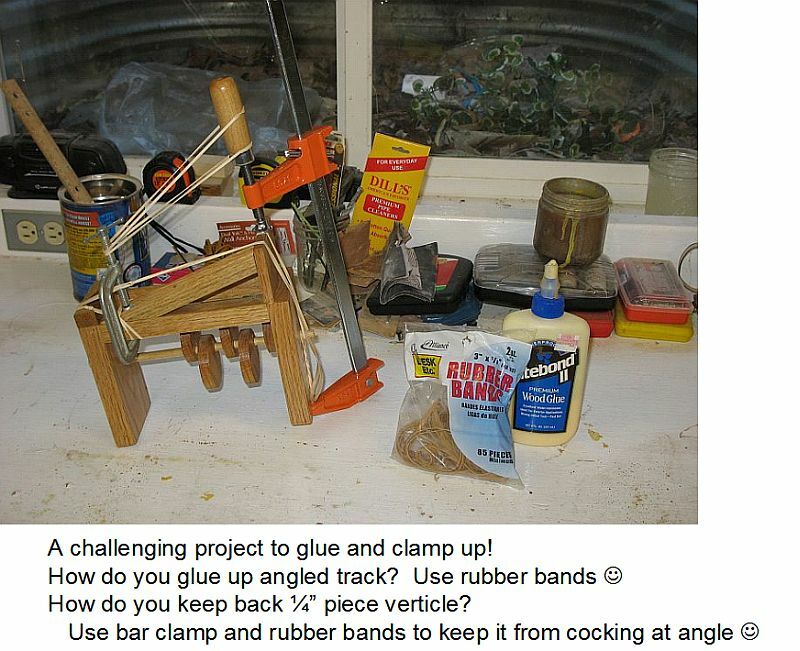 Be careful when you glue and clamp the marble chute, that it is not hanging over the inside space where the vertical cam driven elements ride. I got one glued on too far into this space, such that the cam driven element hit it. I broke the CA glue loose with a screw driver, and re-glued it in the correct position. 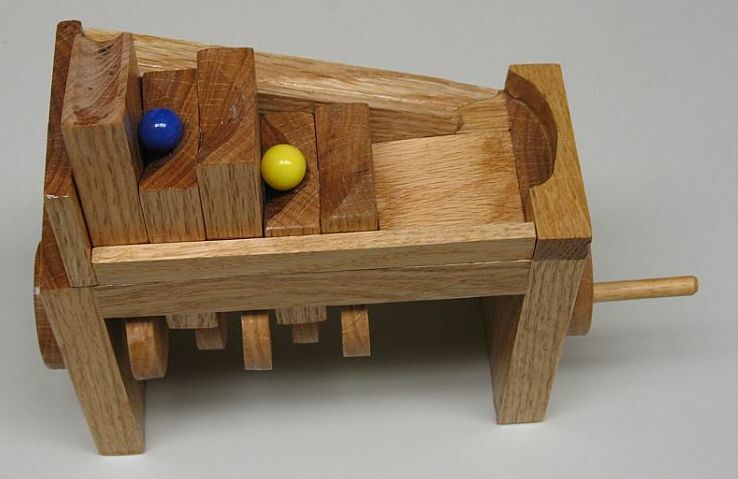 On the 2 marble games I built, I had to shorten the front and back pieces. It works better on the back piece if the marble does not go directly into the chute......but gets captured and lifted into the chute. The front piece was too tall for the marble to fall into it. 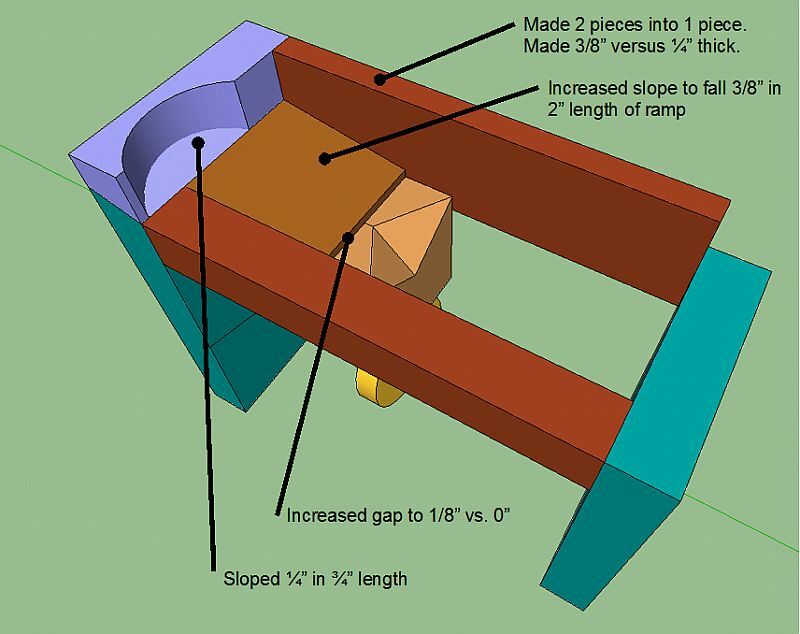 I need to decrease the fall of the sloped piece from 3/8" to just 1/8". This gives more guidance on the vertical driven cam.